DREAMING THE IMPOSSIBLE. 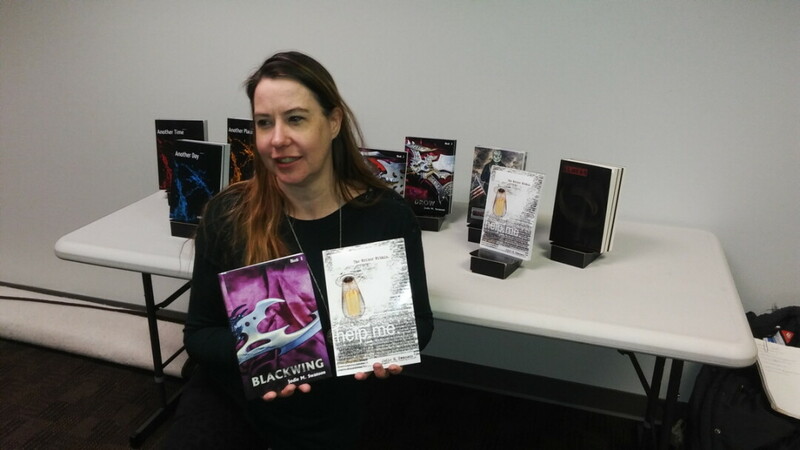 Prolific local author Jodie Swanson has penned a staggering collection of books in her writing career often dealing with fantasy, the paranormal, military, and conspiracy themes. “My dreams make my novels,” Chippewa Valley author Jodie Swanson explained. “Illness was a 40 minute dream, and I took two years to write it out,” she said. So far, she has written an impressive ten novels, and has readers as far away as the UK, Germany, and Australia. Swanson’s tenth novel, The Writer Within, was just released last month, and centers on a writer falsely accused of murder. While attending Owen-Withee High School, Swanson found inspiration from her English teacher, Debra Granquist, who assigned journal writing. Later on, as a college freshman, Swanson’s writing was deemed “too good” for a student who wasn’t even an English major. Her English professor knew author Anne Rice, and asked Rice how a student could write like Swanson did. After a stint in the Air Force and completing college, Swanson had major surgery, and she continued writing her Another Day series while recovering. At that point, writing became a serious endeavor, but agents didn’t like her style. That didn’t dissuade Swanson, who knew she was onto something good. She ultimately pursued self-publishing. Swanson describes her novels as genre-bending, often mixing fantasy, paranormal, military, and conspiracy elements. Swanson’s friend, Bryce Rogers, designs the covers for her books, but she often already has an image in mind. For the Blackwing, Minotaur, and Drow covers, Swanson took the photos herself. Swanson writes in her free time, when she’s not with her horse or hiking. She wasted no time after publishing The Writer Within, immediately beginning work on Empire of Angels. For the sake of Swanson’s fans, let’s hope she squeezes in a nap or two. You can follow Swanson on Facebook, at facebook.com/JodieMSwanson.